As readers of a previous post will know, since the retirement of the Space Shuttle in July 2011, America has been unable to put any astronauts into orbit around the Earth. Instead, it has been reliant on the Russian Soyuz spacecraft to ferry astronauts to and from the International Space Station (ISS). This situation may finally change in 2018; in the final two months of the year there are two missions tentatively planned to take astronauts to the ISS on American spacecraft. Interestingly, as a result of a change in space policy by the Obama administration eight years ago, both these missions will be in spacecraft designed and built by private companies, rather than NASA. The Boeing CT-100 Starliner Space Capsule – image from NASA. In late 2018 this spacecraft may take astronauts to and from the ISS. In a major speech in 2010, US President Obama announced a major shift in the function of NASA in American human space flight. ‘By buying the services of space transportation — rather than the vehicles themselves — we can continue to ensure rigorous safety standards are met. But we will also accelerate the pace of innovations as companies — from young startups to established leaders — compete to design and build and launch new means of carrying people and materials out of our atmosphere. …. So, rather than build its own spacecraft to replace the Space Shuttle, NASA awarded grants to private companies to support research and development into human space flight. The program had a number of phases. In the first phase five companies were awarded grants to partially fund the research and development of the key technologies and capabilities that could ultimately be used in human space transportation systems. In the next phases, NASA awarded further grants to four companies to develop spacecraft that could send to astronauts to the ISS after the Space Shuttle’s retirement. After another selection process, in 2014 NASA made the final decision that the winners of the contracts for up to six crewed flights to transport astronauts to and from the ISS were as follows. 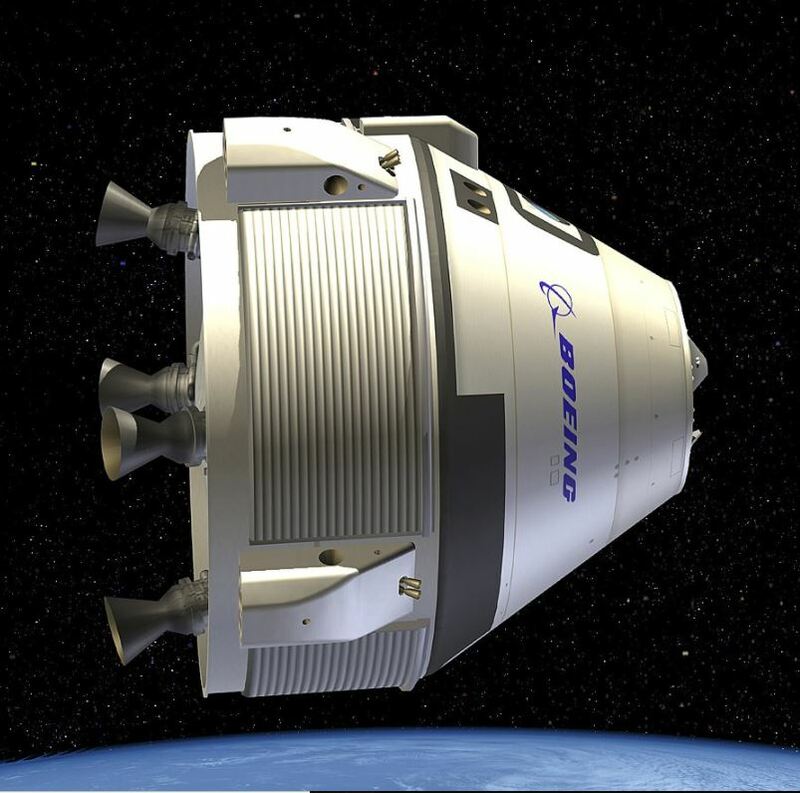 Boeing – They were given a contract worth up to $4.2 billion, to transport astronauts on their CT-100 Starliner spacecraft. Space X – This is a company set up by Elon Musk, the co-founder of Paypal. 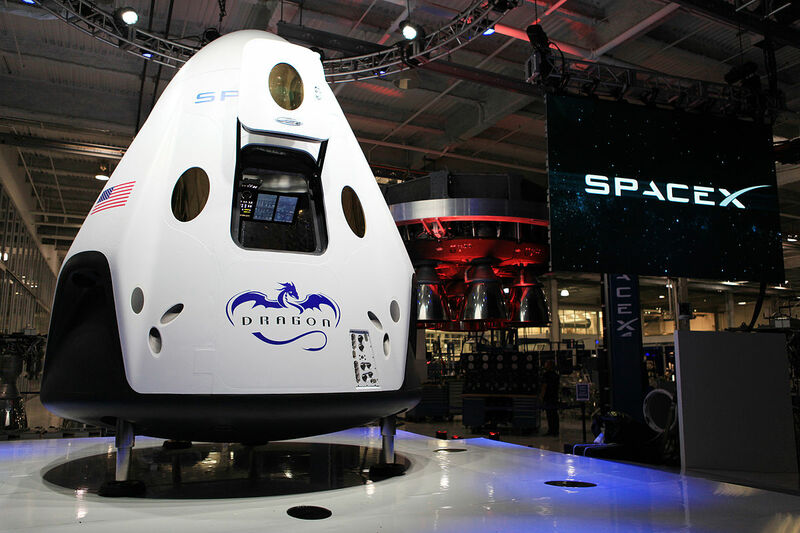 They were given a contract worth up to $2.6 billion to transport astronauts on their Dragon V2 – pictured below. For more details see the reference below (NASA 2014). When the final decision was made it was hoped that the winning companies would be able to launch manned missions to the ISS by 2017. However, perhaps unsurprisingly, there have been numerous delays in the development of both spacecraft and the launch dates have slipped. According to the current launch schedule (https://www.nasa.gov/launchschedule/ ) , the target dates for unmanned test flight of both spacecraft are August 2018, although an exact date hasn’t been specified. If there are no further delays and these test flights do take place in August and are successful, then in November 2018 the Boeing CT 100 spacecraft will be the first American spacecraft to carry astronauts into orbit since the retirement of the Space Shuttle. This will be followed by Dragon v2 the following month. The contract terms are that both companies will charge NASA around $60 million for each seat on a flight to the ISS. This is slightly cheaper than the amount it pays to the Russian space agency for a seat aboard Soyuz. The real boost is that, rather than the money going to the Russian space agency, it will go to American companies, boosting American high technology industries and creating American jobs. Once they have fulfilled their contractual commitments to NASA, both companies are free to sell to additional spare capacity to space tourists willing to spend around $60 million dollars for a flight into orbit. 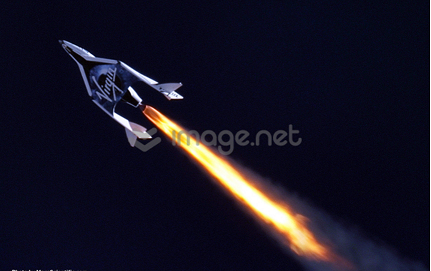 This would be a very different type of space tourism than that offered by Virgin Galactic where customers will pay $250,000 for a three hour flight of which only two minutes are above an altitude of 100 km, which is defined as the boundary of space. Musk refused to say who the individuals were or how much they had paid, but I would expect that the total cost of the spaceflights will be over $100 million dollars each. To achieve enough speed to escape from the Earth’s gravity and reach the Moon the mission would use SpaceX’s new booster, the Falcon Heavy rocket, which was first launched in February 2018. The spaceflight would be likely to follow a path known as free-return trajectory. 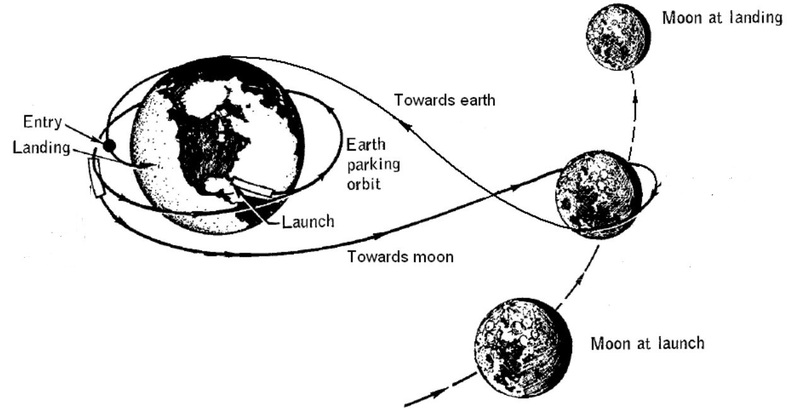 I’ll talk about free-return trajectories in a later post, but essentially the idea is that it uses the Moon’s gravity to slingshot the spacecraft back to Earth, thus minimising the amount of fuel needed. A typical free-return trajectory – image from Wikimedia Commons. The original announcement said the spaceflight would be in 2018. 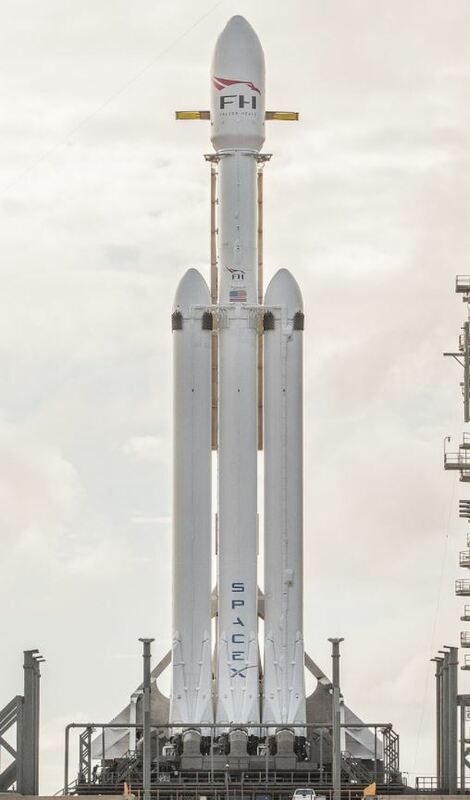 However, according to reports earlier this month, like this one, Elon Musk has said that the mission will be delayed because SpaceX will be focussing its effort on developing a new launcher with twice the thrust of Falcon Heavy. This is currently called the ‘Big Falcon Rocket’, but I expect it it will be given a different name as the project progresses. Therefore, I think that although this spaceflight will take place, it is unlikely to happen before 2020. However when it does occur I am sure that many people will follow it with great excitement. It will be the first time that humans have ventured outside the low Earth orbit since the last Apollo moon-flight in 1972. Even though NASA is now commissioning private companies to transport astronauts into low Earth orbit, it has not abandoned developing its own manned spacecraft altogether. It is currently developing the Orion spacecraft and a new launcher called the Space Launch System. Around 2023-5 the spacecraft is expected to take its first crew into orbit around the Earth, and it will have the capability take a crew of up to four beyond low Earth Orbit, perhaps on a mission around the Moon or to a nearby asteroid. NASA (2014) NASA chooses American companies to transport U.S. astronauts to International Space Station, Available at: https://www.nasa.gov/press/2014/september/nasa-chooses-american-companies-to-transport-us-astronauts-to-international (Accessed: 7 February 2018). 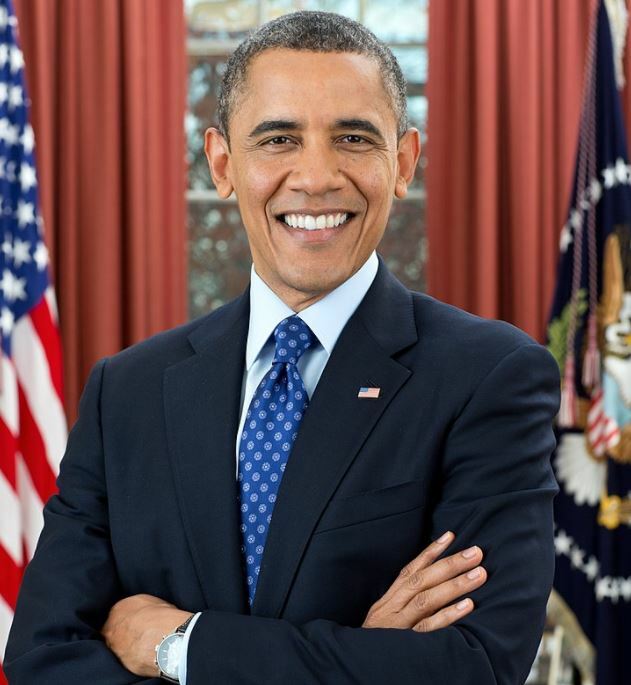 The White House (2010) Remarks by the president on space exploration in the 21st century, Available at: https://www.nasa.gov/news/media/trans/obama_ksc_trans.html(Accessed: 6 February 2018). Sadly a little out of my price tag too ! I think these are exciting times. Of course for most of us and our descendants, Earth will always be the place we plop our feet on in the morning when we get up, but SpaceX and Boeing are making space exciting again. Putting our own people with our American made rockets is cool. Having a car out there on the way to the asteroid belt is, well, eccentric. But look how much buzz it generated. I think it’ll have as bigger impact on this and the next generation of space-o-philes as the race to the Moon did on mine and the one before me. For that it’s value is priceless. I agree, I think when American manned spaceflights finally resume, even it doesn’t quite manage to happen this year, then the public interest in spaceflight will increase massively. Both craft have been postponed till 2019. Expect more delays. Neil Armstrong died in an era where the Americans weren’t able to put a man in space (and he deplored that) and this period will only last longer. Don’t trust tax payer money magnets like Boeing and Musk. It is shame how things have slipped. Let’s hope that one or both of these spacecraft get put an astronaut in space next year.